Telephones : +91 522 - 2435690, 2435342"
"Education enables individuals to become conscious subjects of their own growth and responsible participants in a community." As we surge ahead undaunted, propelled by the divine inspiration and courage bestowed upon us by the Almighty, we gather new experiences which enrich our lives. These experiences not only live in our memories but also provide us enlightenment for the years to come. Year of establishment of City Montessori School, Kanpur Road Campus is 1st July 1996. 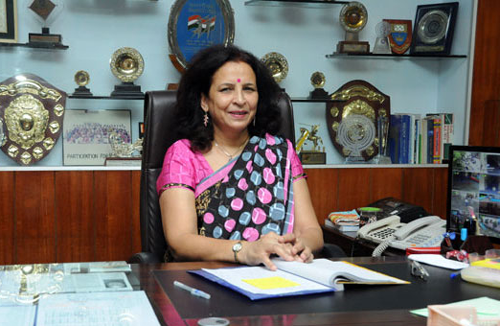 CMS Kanpur Road is a garden of talents, flourishing and flowering happily in the able guidance of its dynamic Principal Dr.(Mrs.) Vineeta Kamran. It is much more than an educational opportunity; it is a truly nurturing environment, for mankind to a second home. It gives a strong sense of community to all our members, pupils and staff alike. As we surge ahead undaunted, propelled by the divine inspiration and courage bestowed upon us by the Almighty, we gather new experiences which enrich our lives. These experiences not only live in our memories but also provide us enlightenment for the years to come. The past year was an eventful one for CMS Kanpur Road Campus. The branch touched a new pinnacle of glory and achievement with unprecedented ISC and ICSE results. Among the top ISC Affiliated Quality Schools in India, we gave 26 toppers in the All India Top 20 ranks with I, II and III positions. Sakshi Pradyumna, the All India topper secured 99.50% and was also conferred the ‘Gold Standard of the International Award for Young People’ by Honorable Sir Dominic Asquith, British High Commissioner to the Republic of India, Sanjeevani Hazra, the All India Rank Second, scored 99.25%, Soumya Shikhar Mishra and Utkarsh Nigam scored 99% and got the All India Third Rank. It ensures work force management – online data attendance of menial staff. Effective Resourceful Affect (ERA) by Primary and Junior staff for e-content. Fitroz Application for Pre-Primary and Primary students helps to enhance the spoken English. New Tata class Edge installed in Interactive Boards is very helpful for students. Dashboard for JYEP, Environment Coordinator, Counsellor, Staff members (all teaching and non-teaching are using it). ERP system helps in database maintenance as well as for fee collection, result record, etc. for the campus and Biometric System has been also installed for regular attendance of all staff members. A training centre for other orientation program in WUCC are the latest feature of the branch. A Co-curricular pursuit is the main unread which encourages development of character and gives spring to mind. There is ample space for scholarly teaching with pupils believing in the pursuit of academic excellence, it is the overall, cultivation of mind, body and spirit while they are still young cultivation of mind, body and spirit while they are still young. The school has a Swimming Pool, a Splash Pool, Music Room, Dance Room, Video Room, Science Park, Fun Room, Activity Room, Math’s Lab, English Lab, Smart Class, and a Gymnasium, Dance Classes in the Junior Section, Auditorium, 11 Halls and a Picture Gallery. The two International Guest House, named “Kaizen House” and “CISV Guest House” with modern facilities are also present. This year, many sets of exciting, enjoying & challenging swings & slides have been installed in the ground area to foster self esteem, develop coordinated movements and reduce risk of psychological problems in children besides providing recreation and enjoyment. School has strength of 7925 students with Pre-Primary as 1100, Primary as 3428, Junior as 1816 and Senior 1892.